It may sound disgusting, but ringworm actually has nothing to do with worms. Ringworm is a general term for various fungal infections that usually affect the skin, scalp, toenails or fingernails. They are incredibly common in children, but are easy to treat. The reason ringworm gets its lovely name is because the infection often takes a ring shape, and resembles a tiny worm imprint on the skin. So never fear – ringworm is never fun, but it’s not as nasty as it sounds! Ringworm is caused by fungi known in the medical world as dermatophytes. The spores are spread easily and can be transmitted from person to person, from animal to human, from soil and from sharing clothes and towels. People who have ringworm typically experience a red rash, which grows in a circular ring shape to resemble a worm. The rash can become red, itchy and inflamed, and will vary according to the type of fungus. Your GP can usually diagnosis ringworm simply by looking at the skin. In some cases, however, a special blue light may be used, as some types of ringworm will glow fluorescent. Occasionally, patches of skin will be looked at using a microscope for a more accurate diagnosis. Ringworm has been known, in some cases, to mimic other skin ailments, so it’s always a good idea to see your GP for an accurate diagnosis, even if you feel confident that ringworm is the culprit. Eczema, for example, can occasionally look like ringworm, but will not respond to ringworm medication. 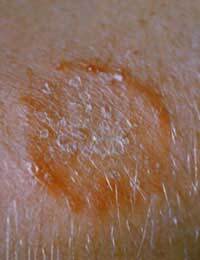 Ringworm can also mimic psoriasis in some cases. Scalp ringworm (tinea capitis): Most common in children and very rare in the adult population. It can start as a small spot, but then become larger and inflamed. In some cases, it can cause the hair to fall out, leaving bald patches on the scalp. Skin or body ringworm (tinea corporis): Common in people of all ages. can appear on various parts of the body, including arms, legs and trunk. Groin infections (tinea cruris): Most common amongst young men, and may not appear in a ring shape but in a large, scaly red patch. Nail infections: Can affect anyone, causing the nails to become overly thick or discoloured. Fairly uncommon to appear in the population before puberty. Athlete’s foot (tinea paedis): This is the common name for ringworm of the feet, which is caused when hot, moist conditions between the toes do not create a proper barrier against the fungus. Treatment for ringworm is fairly straightforward, and fungal creams can be brought directly from your pharmacist without a prescription. Usually, the infection will disappear using creams in about four weeks. In cases where the ringworm is pronounced, however, there may be the need for oral tablets taken over a period of time. This is especially true with nail infections. Occasionally, tablets are needed to be taken for up to two years to completely clear the infection. Wash all sports clothing regularly, and never wear twice without a good wash. Wear flip-flops or other types of protective footwear in locker rooms and communal showers. Wash your feet regularly and dry them properly, and wear only cotton socks when doing sports. Wash your hands on a regular basis, particularly after touching pets. Contact your GP straightaway if you suspect you or your children have ringworm. Wash handtowels regularly, and never share bath towels. Ringworm is an unpleasant infection, but one that in most cases can be treated fairly easily. Families that have pets are especially prone to having ringworm, and ringworm that is caught off an animal can be an infection that lasts longer, is more widespread and be harder to clear. If you suspect you or your children have ringworm, see your GP for the best course of treatment before it spreads. Leaving it alone and hoping it will go away by itself can only cause others to catch it, and make the primary infection get worse.